The officials said their plan would ensure both that the ecosystem of the Sacramento River’s delta would be reinvigorated and that water deliveries to the south would become reliable. The $14 billion blueprint envisions both the physical and psychological re-engineering of California’s plumbing, including the construction of twin 35-mile-long pipelines, each about as wide as a three-lane highway, that would tap river water from a more northerly, less polluted location. The pipelines would deliver the water straight to the conveyances in the south, largely replacing a system that pumps water from the murkier southern part of the 500,000-acre delta, disturbing the fragile ecosystem. It also includes financial incentives for consumers of water — municipalities and farming interests — to use less. But beyond that, the sweeping and ambitious plan was noticeably shy of details. Northern California legislators objected. “This rush to construction without the benefit of science is going to do irreparable harm, to Northern California in particular,” Representative Jackie Speier, a Democrat from the Bay Area, said. The plan to move forward was announced at a news conference in Sacramento, about 35 miles from this small town at the northern edge of the delta where the Sacramento and San Joaquin Rivers meet. The local marshland ecosystem has suffered, in the words of one area environmentalist, a “biological meltdown” after 150 years of levee building and ever-increasing water withdrawals. Repairing the ecosystem, where fresh and salt water, overwhelmed by agricultural runoff and invasive species, push against each other in a perpetual dance, has been made a political priority. Officially, it is as important as assuring the viability of water deliveries through one of two major water arteries for Southern California. The other is the Colorado River. For decades, advocates for fish, for cities and for farmers have been trying to agree on a plan to manage the water flowing through the delta. The Bay Delta Conservation Plan has been fraught from the beginning, and its plans widely criticized. With the announcement Wednesday, state and federal leaders sidestepped most of the specifics that could create controversy: operational details like how much water would go through the pipes and when, scientific goals for recovery of endangered and threatened fish, and even economic assessment of whether the benefits would outweigh the costs. The management of the new apparatus would spring from a hybrid of agencies; documents released by the state last week described a “decision tree” to ensure that science was a main element of operational decisions. Many scientists believe that delivering the water that powerful agricultural interests say they need — one-quarter of the Sacramento River’s annual average flow of 22 million acre-feet — would further harm the battered populations of smelt, sturgeon, salmon and steelhead. The failure to solve this dilemma has been the catalyst for some willingness to compromise, since most of the stakeholders agree that the current situation is untenable. Decisions in recent years by the federal Fish and Wildlife Service and the courts to ensure there is enough water for fish have led to water delivery cutbacks in drought years. SAN JOSE, CA — California Water Service Group (NYSE: CWT) today announced net income of $13.0 million and earnings per share of $0.31 for the second quarter of 2012, compared to net income of $12.2 million and earnings per share of $0.29 for the second quarter of 2011. Revenue for the second quarter increased $12.2 million, or 9.3%, to $143.6 million compared to the second quarter of 2011. Sales to new customers added $0.2 million, general rate increases added $3.0 million, offset rate increases to recover increases in purchased water costs added $5.9 million, and increased usage by existing customers and other activities added $3.1 million. Total operating expenses for the second quarter of 2012 increased $12.1 million, or 10.8%, to $123.9 million. Water production costs increased $7.9 million, or 17.7%, to $52.7 million, due primarily to increases wholesaler water prices and increases in the quantity of water produced. Administrative costs increased $1.6 million, or 7.9%, to $22.2 million, due primarily to increases in wages and benefits. Increases in pension costs do not affect earnings because in California, the company is allowed by the California Public Utilities Commission (CPUC) to track pension cost increases in a balancing account for future recovery. Other operations expenses increased $2.0 million, or 12.6%, to $17.7 million, primarily due to increases in expenses for water treatment, water quality, and conservation programs. Conservation program expense increases are also tracked in a balancing account for future recovery. Maintenance expense decreased $0.7 million, or 12.9%, to $4.6 million, compared to $5.3 million in the same period last year. Depreciation expense increased $1.3 million, or 10.8%, to $13.7 million, due to increases in utility plant. Other income, net of income taxes, remained unchanged at $0.2 million. Interest expense decreased $0.7 million, or 8.9%, to $6.9 million due to increased capitalized interest and decreased short-term interest rates. "Results for the second quarter are in line with our expectations," said Pete Nelson, Chairman and Chief Executive Officer. "As we move into our busy season where we see significant increases in demand, the Company will stay focused on serving our customers and operating as efficiently as possible," added Nelson. In addition, the Company filed its 2012 General Rate Case (GRC) for California Water Service Company, its largest subsidiary. In its application, California Water Service Company is requesting authorization from the CPUC to increase rates to add revenues of $92.7 million in 2014, $17.2 million in 2015, and $16.9 million in 2016. The filing, which begins an 18-month review process by the CPUC, reflects higher costs of providing water service, lower forecasted sales, and funding for necessary capital projects for 2014 through 2016. The CPUC requires a GRC filing every three years to ensure that rates reflect the actual costs of providing service while allowing the Company a reasonable return on investment in water system infrastructure. "The 2012 GRC represents the second time we have filed all of the California operations in one rate case," said Nelson. "We expect a decision by December of 2013," he added. In addition, on July 12, 2012, the CPUC approved the Cost of Capital decision that establishes an authorized return on equity of 9.99% and cost of debt of 6.24%, with a capital structure of 46.60% long-term debt and 53.40% common equity. It sets the authorized return on rate base at 8.24%. In addition, the proposed decision authorizes continuation of a Cost of Capital Adjustment Mechanism (CCAM), which provides for an adjustment in the return on equity in 2013 and 2014 if the cost of long-term debt, as defined by an index of utility debt rates, varies from the most recent index by 100 basis points or more. All stockholders and interested investors are invited to listen to the 2012 second quarter conference call on Thursday, July 26, 2012, at 11:00 a.m. (EDT), by dialing 1-877-681-3372 and keying in ID# 4684903. A replay of the call will be available from 2:00 p.m. EDT on July 26, 2012, through September 23, 2012, at 1-888-203-1112, ID# 4684903. The call, which will be hosted by Chairman and Chief Executive Officer Peter C. Nelson and Vice President and Chief Financial Officer Martin A. Kropelnicki, will also be webcast under the investor relations tab at www.calwatergroup.com. California Water Service Group is the parent company of California Water Service Company, Washington Water Service Company, New Mexico Water Service Company, Hawaii Water Service Company, Inc., CWS Utility Services, and HWS Utility Services. Together these companies provide regulated and non-regulated water service to nearly 2 million people in 100 California, Washington, New Mexico, and Hawaii communities. Group's common stock trades on the New York Stock Exchange under the symbol "CWT." Additional information is available at our Web site at www.calwatergroup.com. SAN FRANCISCO, July 25 (Reuters) - California Governor Jerry Brown and U.S. Interior Secretary Ken Salazar on Wednesday unveiled a multibillion-dollar plan for two giant tunnels that would dramatically reconfigure the state's water delivery system. The nearly $24 billion project aims to help restore the habitat of the Sacramento-San Joaquin River Delta and improve the reliability of water supplies to the arid central and southern parts of the state. The state already has two massive aqueducts that move water from the north to the south, but the way in which the water is transferred has severely damaged fish populations and degraded their habitat in the delta. The planned project is similar to one Brown approved three decades ago when he was first governor. Voters rejected that project amid vociferous opposition from northern California residents. A similar political battle will be fought this time around. "It's a long time in coming," the 74-year-old Democrat said, asserting that the project balances regional, environmental and agricultural concerns that have long blocked efforts to expand the state's water infrastructure. The twin 35-mile tunnels would divert water from the Sacramento River just south of the state capital of Sacramento to the aqueduct system. The tunnels would bypass the delta rather than drawing water directly from it, reducing the number of fish killed by pumps and restoring natural water flows. The tunnels would reduce the risk of environmental lawsuits that could interrupt water supplies, a critical concern for California's multibillion-dollar farming industry. An estimated 25 million Californians who would rely on water from the tunnels would repay the bonds issued to finance them. The cost of the tunnels is pegged at $14 billion. The additional $10 billion in costs includes debt service payments and 40 years of expenses for its operation, said Richard Stapler, a spokesman for the state resources agency. Additional money for habitat restoration in the delta could come from an $11 billion water bond that lawmakers recently deferred until 2014, Stapler said. Critics called the tunnels an expensive boondoggle and said there are cheaper conservation measures for the delta. Kate Poole, a senior attorney with the Natural Resources Defense Council, said the plan for the tunnels is "putting plumbing before sensible policy." "Twenty-first century technology opens up new sources of water, including water conservation and efficiency, recycling and other tools to allow us to reduce our reliance on the delta, allow fish to recover, farmers to farm and people to turn on the tap and rely on good quality water," Poole said. California oil regulators will hold their final public meeting on hydraulic fracturing in Sacramento on Wednesday, capping a months-long series of workshops aimed at shaping rules for the controversial method of oil extraction. The meeting is set for 7 to 9 p.m. at the headquarters of the California Environmental Protection Agency, 1001 I St.
Nearly a dozen environmental and consumer groups plan to rally outside the building to call for a moratorium on fracking, which involves injecting chemical-laced water and sand deep into the ground to tap oil. Environmentalists and community activists have raised concerns about potential environmental and public health hazards, including contaminated drinking water. Representatives from the energy industry have said that hydraulic fracturing is safe and that oil companies have used the technology in California for decades without incident. Much of the anxiety stems from the fact that, unlike other oil-producing states, California does not require oil companies to disclose where they use the procedure or what chemicals they inject into the ground. Assemblyman Bob Wieckowski (D-Fremont) has introduced legislation that would make such disclosure mandatory; Assemblywoman Betsy Butler (D-Marina del Rey) is pushing a bill that would ban fracking in California until regulators write rules governing the procedure. For their part, regulators have conceded the need to collect more information on hydraulic fracturing. They have pledged to begin drafting regulations later this year, using the input from the series of seven public workshops. Twenty-four people have been arrested during a fourth night of violence after fatal weekend police shootings of two men in Anaheim, California. The violence mounted outside City Hall as council members voted unanimously to investigate the incidents. About 600 protesters threw rocks, broke windows, and threw a petrol bomb at a police car as 250 policemen fired soft bullets and pepper balls at the crowd. Order was restored around 02:00 (09:00 GMT), police said. At least six people were injured, including a police officer who was struck on the arm with a brick, a protester who was hit in the chest by a pepper ball and three reporters who were struck by rocks and a beanbag round. Rubbish bins were set on fire during a seven-hour standoff with police wearing riot gear. Anaheim Mayor Tom Tait has called for state and federal investigations, and the FBI said it would review one of the shootings to see if a civil rights investigation should be launched, the Los Angeles Times reported. "Anaheim Police Department is just way out of control," protester David Zavala, 25, told the newspaper on Tuesday evening. "The cops are supposed to be there to protect and serve." Police Chief John Welter said Manuel Diaz was fatally shot on Saturday after two policemen approached three people who were behaving suspiciously in an alley. He then tried to run away. Mr Welter did not say what led the policeman to shoot Diaz. But the police chief said the man did not obey orders to stop and threw something that police believe contained heroin onto the roof of a nearby building. Kerry Condon, president of the Anaheim Police Association, said: "Feeling that Diaz was drawing a weapon, the officer opened fire on Diaz to stop the threat," the Los Angeles Times reported. The police association's statement said that "the documented gang member" was holding a "concealed object in his front waistband with both hands." Diaz was shot in the leg and the back of the head, court papers are reported to say. His family filed a lawsuit against the police department on Tuesday seeking $50m (£32m) in damages. At a Wednesday press conference, lawyers for the Diaz family said it was not true that Manuel Diaz was a gang member. They called for the officer who shot him to be arrested and a full trial to be held. His mother, Genevieve Huizar, said that she was overwhelmed by the outpouring of support from the community but called for protests to be peaceful. "Please stop the violence," she said. "It's not going to bring my son back." The second shooting took place on Sunday, when police saw a suspected gang member in a stolen car. After a short chase, three people jumped out of the sports utility vehicle and ran. Joel Mathew Acevedo, 21, fired at a policeman who then shot him dead. 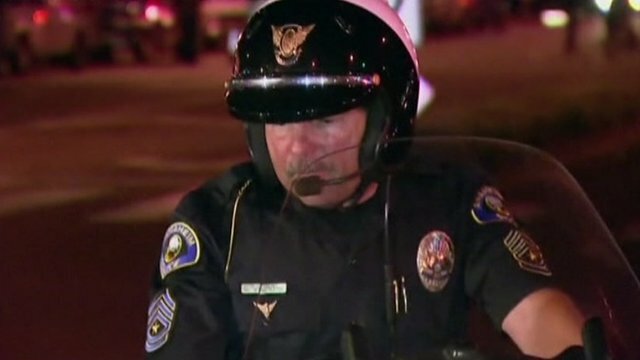 LOS ANGELES (AP) — A California appeals court has reinstated a now-retired paralyzed Los Angeles police officer's product liability lawsuit against gun manufacturer Glock. Enrique Chavez was paralyzed from the waist down when his 3-year-old son accidentally shot him with his service pistol. The lawsuit claims the .45-caliber Glock 21 pistol lacks adequate safeguards against accidental discharge. The Glock has no grip safety, a device attached to the pistol grip that the shooter must deactivate before firing. A Los Angeles judge dismissed the suit two years ago, saying a Police Department review of the gun's design found the Glock's advantages outweighed any inherent risks. The San Francisco Chronicle reports (http://bit.ly/NRKilg ) the 2nd District Court of Appeals on Tuesday reinstated the suit, saying a jury could conclude that a grip safety strong enough to withstand a child's grasp would minimize the risk of accidental discharge. Ten scouts staff in northern California have returned their badges to protest the firing of an openly gay 22-year-old Eagle Scout. The Eagle Scout, Tim Griffin, says his sexual orientation was not previously a problem. He believes that the decision of Boy Scouts of America to uphold its gay ban earlier this month was the reason for his dismissal. Officials said Mr Griffin had been fired for refusing to heed uniform rules and for wearing nail polish and an earring. However, his colleagues at Camp Winton in Amador County said the firing was wholly about his sexual orientation. Ten of the 30 staffers have resigned in protest and some have been wearing nail polish to show their support for him. The Boy Scouts of America announced earlier this month that it will retain its ban on gay members, volunteers and staff. As a private organisation, the Boy Scouts of America has adopted positions since 1991 which state that homosexuality is “inconsistent with the Scout Oath that a Scout be morally straight and in the Scout Law that a Scout be clean in word and deed. Peers seem to have forgotten Britain is suffering a deep double dip recession after splurging 175,000 on new artworks last year. Official House of Lords figures show that tens of thousands has been spent on sculptures, paintings and silverware during the spending spree. The 175,000 is almost ten times more than spent a year earlier because it includes a 108,000 blow out on fresh artwork for the peers' new offices in Millbank next to Parliament. Additions to the giant House of Lords art collection include a 7,500 portrait of suffragette Viscountess Rhondda, who fought for the rights of women to vote, by Alice Mary Burton. There was also 25,200 splashed out on a silver piece by British maker Brett Payne. Another 8,500 was laid out on a bust of Prince Philip, the Duke of Edinburgh, and a 5,000 painting of Queen Victoria's Jubilee procession by Robert Weir Allan. Peers get around 50,000 a year in grants from Government departments to add to the 8,000 pieces of Parliament art on display and in storage. But they can opt to save up the money over several years and go on a huge spending spree. The Lords has been able to build up artworks since the 17th century, and has bought up major pieces throughout the centuries to the present, with some art around 1,000 years old. 'The House of Lords works of art budget for purchases has been halved from 50,000 in 2010/11 to 25,000 in 2011/12. There will be no grant in 2012/13,' a House of Lords spokesman told MailOnline. 'In September 2011 the House of Lords opened a large new office block in Milbank House. A separate grant of 135,000 was provided to purchase works of art for the new building. 'This was a one-off expenditure which will not be repeated. But the spending pales in comparison to the Coalition's plans to reform the House of Lords, which will cost taxpayers nearly half a billion pounds, it has been claimed. Labour peer and economist Lord Lipsey put the estimated cost of running a fully-elected chamber over five years at 484million, enough to fund 15,000 nurses' salaries. 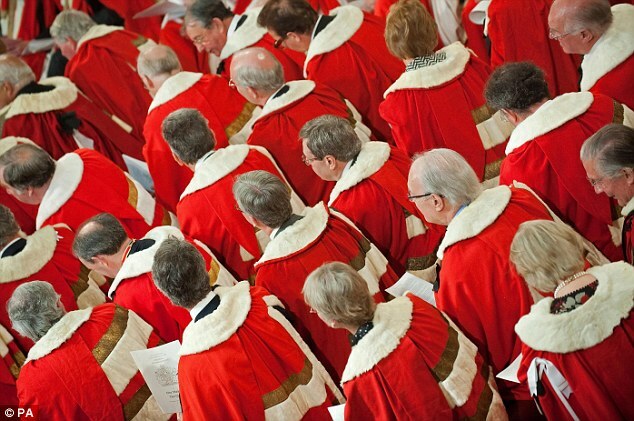 It is 7million more than the previous estimates and more than five times the 91million cost of the existing House of Lords in the last five years, according to the peer. I have long considered that the House of Lords is simply a reward system for failed or old politicians. Can anyone give a serious reason and convincing explanation to justify the continuance of the House of Lords? Presumably there must be a committee who decide what purchases will be made. Can we have their names please? Is the house a place of work or a museum/ art gallery. I find it admirable that such a collection is built on behalf of the nation but surely it should be on public display not adorning the walls of an individuals office. Private display of the items will tend towards 'leakage' where people forget where they came from and having hung in the study for a generation are absorbed in the beneficiaries collection. Do these people live in the same world as the rest of us??????????????????/????????? Rogues, thieves and vagabonds, why don't we rid ourselves of the lot of 'em. bring back the vikings at least they only rob you once.